Manufacturer of a wide range of products which include magnetic rolls separator, over band magnetic separator, wet drum magnetic separator, wet magnetic separator, double drum magnetic separator and inline magnetic trap. 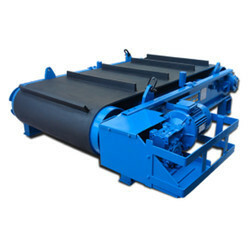 Roll Magnetic Separator is to lower the content of ferrous contaminants in non-magnetic materials, or upgrade the ferrous minerals. It is for dry magnetic separation, with great magnetic intensity, it is suitable to treat weakly magnetic minerals.Magnetic intensity, diameter and number of rolls are optional according to various minerals. Upgrade: Iron ores like hematite, limonite, ilmenite, manganese, , etc.Lower ferrous for: Ceramic and glass materials and other non-magnetic minerals like Andalusite, Barite, Nepheline, Bentonite, Phosphate ore, Calcium carbonate, Potash, Clay, Quartz, Diamonds, Rutile, Feldspar, Fluorspar, Garnet, Silica, Spodumene, Kaolin, Kyanite, Limestone, Zircon, etc. An overband magnetic separator (overbelt magnet) is suitable for the continuous removal of ferromagnetic (Fe) particles – such as iron or steel – from material streams containing a relatively large amount of Fe. The effectiveness of overband magnets varies from 70 to 90% deferrization, this can be increased to higher levels through use of multiple magnetic separators in series. 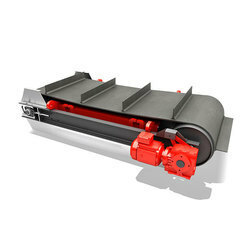 Over belt magnetic separators can be used for recovery (recycling) of ferrous particles as well as for the separation of undesired iron parts (iron pollution). Over band magnets are placed in-line with or perpendicular to flat or trough-shaped conveyor belts. The (ferro-)magnetic particles are drawn out of the raw material flow and automatically and continuously ejected. Wet Magnetic Separators consist of separator drum, magnetic system, separator tank, transmission device and overflow devices for feeding and discharging. They are widely applied in magnetically separating magnetite, de-watering and de-ironing for non-metallic ores. According to different working principles, Wet Magnetic Separator are classified into three Kinds: current style(S), counter-current style (N) and Semi-countercurrent style (B). 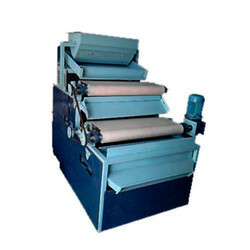 Permanent magnet drum Wet Magnetic Separator has two kinds of structures: rotating and fixed. The fixed is suitable for wet sorting of fine particles of strongly magnetic material in weak magnetic fields, or removing the non-magnetic minerals in the strong magnetic minerals. When the slurry is injected into the magnetic field, the strong magnetic mineral is adsorbed on the cylinder surface, the weak magnetic and non-magnetic minerals are successively excluded, the strong magnetic minerals adsorbed on the cylinder was taken out of the magnetic field with the rotation of the cylinder. 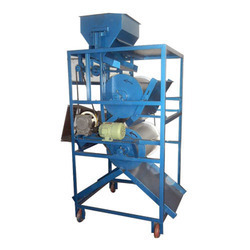 The rotating one is suitable for dry sorting of fine strong magnetic minerals, for the role of high-speed rotation, the amount of rolling of the magnetic particles in Wet magnetic separator is much larger than the ordinary magnetic separator. It has a significant the effect for the destruction of magnetic agglomeration and improves the high-grade ore. Magnetic material and non-magnetic material, the machine is suitable for roughing and selecting materials whose sizes are 6-0mm. 1) Rare earth magnet assembly produces higher magnetic force. 2) Double-layer stainless steel drum shells make it easy for replacement. 3) Durable aluminum end cap and stainless steel flange. 4) Double-row self-aligning ball bearing makes it easy for replacement without disassembly of drum. 5) Modular structure makes it easy for installation and magneti angle adjustment. bin at the side of the conveyor. This type of separator is mainly used in the quarrying and recycling industries where high levels of contamination require a self cleaning magnet. 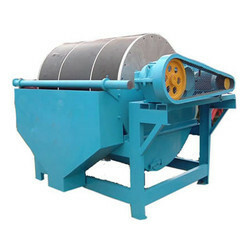 Used mainly for purification of materials and protecting the crushing machine, milling a chine at next production step. Magnetic separator is widely applied in cement, chemicals, plastics, coal, refractory, building materials, food and other industries. Double Drum Magnetic Separators provide an efficient means for extracting ferrous material from dry, bulk products in free-flowing processing systems. They are comprised of a stationary permanent magnet, either standard Ferrite Magnets or High Power Rare Earth Magnets enclosed in a non-magnetic stainless-steel drum. Product flow is diverted so that it falls onto the top and flows across the surface of the drum. Ferrous matter contained in the product flow is drawn to the drum's surface (and held against it) by the powerful magnet housed inside. While non-ferrous products fall from the side of the drum in a normal manner, ferrous metal clings to its surface. As the portion of the drum with the ferrous material rotates to the side opposite the product flow, the magnetic field is reduced so that the ferrous matter falls from the drum into a collection container. The end result is purified product ready for processing without the worry of costly damage caused by tramp metal. Rare Earth, Neodymium is 5 times stronger than Ceramic Magnets and can remove micron sized particles. Magnetic Filters are used for filtration of iron particles from products in liquid/slurry form. 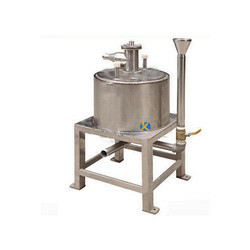 They are essentially used in chemical, food, pharma and oil industries. They are also frequently used in hydraulic circuits in cooling systems. The Filter Magnets are made up of either Ceramic or High Intensity Rare Earth Magnets. Magnetic filters are installed at a suitable location along the passage of fluid. The flowing liquid is made to travel around the magnetic field of high intensity filter magnets where fine ferrous particles get arrested in a magnetic trap. These arrested fine iron particles can be removed manually after removing the top lid of the filter. Drain plug is provided at the bottom face for periodical cleaning of the filter system. The unit comprises of a vessel, magnetic lid assembly and fasteners to secure the unit together. Magnetic system is made up of either Ceramic or High intensity Rare Earth magnets. 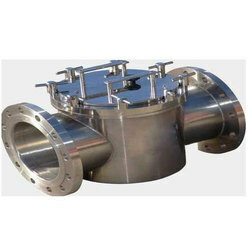 The Magnet unit is enclosed in stainless steel housing making it suitable for use in Chemical, Paper & Ceramic Industry. The Magnetic Filter is easily removable from the stainless steel enclosure by loosening a few quick release fasteners. These Magnetic filters are made up of Stainless Steel 304 / 316 shell with inlet and outlet flange connections and a drain plug. The filters are made up of high intensity permanent magnets (Ndfeb) made in the form of elements. These magnetic elements are fixed on the top lid and are arranged in circular format so that the liquid is exposed to maximum area of elements. Once the fluid is passes through the filter, iron contamination gets arrested on the elements. This is removed manually after removing the top lid of the filter. The self cleaning filters consist of sleeves provided over the elements. The iron particles get trapped over the sleeve when the fluid is passed through the filter. When the elements are removed along with the top lid from the sleeves, the iron particles get dropped from the sleeve on the bottom of the filter this is removed through the drain plug by injecting pressurized water. v Size and concentration of contamination. These manual magnetic floor sweepers allow easy metallic debris pick-up on virtually any floor surface. Magnetic sweepers help get rid of damaging steel, nails, wire, screws and other metallic debris. Simple-to-use magnetic sweepers automatically pick up steel objects to provide an alternative solution to brush sweepers, vacuums and power sweepers. Can be used over asphalt, concrete, grass and gravel. 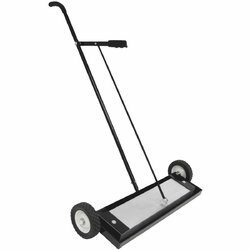 Handle and roller bearing wheels allow easy push-broom style sweeping over hard floor surfaces and rough terrain. Multi-Surface Magnet features a load release lever for easy removal of debris. Made with heavy gauge aluminum housing. The hopper magnet protects molding machinery and other processing equipment from damaging ferrous metal separation and can be conveniently monitored to the transparent drawer face. Slide gate shuts off product flow and is provided as standard feature. An easy clean design is available. Hopper magnet removes Small particles of the ferrous metal from free- flowing Powder and granular Material. These Permanent magnetic separators are a very cost- efficient way to remove damaging tramp metal and light concentration of ferrous contaminants from chemicals, pharmaceuticals, cosmetics, Plastics, food, grain, fertilizers sand, clay and minerals. The relevant sized magnetic grill is fitted in the hopper. Smoothly running raw material is fed through the hopper, just upon entering the hopper iron particles if any stick to magnetic grill and stay where they are. Feeding can be continuous and break is not mandatory. When considerable amount of pull is done by magnetic field, dusting is needed. The magnetic grill is lifted from the hopper and picked manually with aid of gloves or necessary protection. 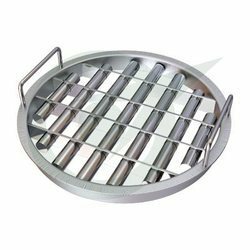 Magnetic grills with automatic cleaning facility are also available which avoids manual interference. From the sales point of view the magnetic grills are made in many shapes to fit hopper. The common forms of grill magnets are squares, rectangle and round. These are the usual models which are required for sales. Adhering to customer needs we give tailor made dimensions which facilitate in closing sales.